Create a fun and festive birthday party using a Pink Flamingo theme! Great for summer or pool parties ... or anytime you want to celebrate! On plain pink note cards glue pink feathers (boa type) on the top of the card. Cut out flamingo legs and paste onto the cards front - you could also use pink pipe cleaners for the flamingo legs. Pink and green (or orange!) striped or polka dotted note cards. Embellish with feathers. Decorate the Flamingo party in pinks and greens or pinks and orange. Solid pink table cloths or pink and green/orange polka dotted or striped table cloths look summery and bright. Attach pink with white and green helium balloons onto the mailbox. Cut out Flamingo footprints from construction paper and tape them down along the party walkway - you can also draw the footprints with chalk. 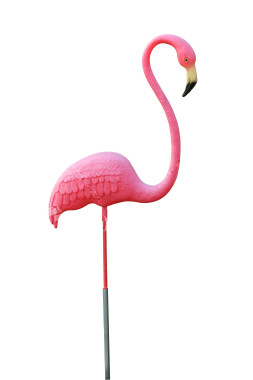 Place a flock of plastic pink flamingos in the front yard (these can be used later for games). Place pink feather boas on party tables or at each place setting if you are giving them away as party favors. Pink strings of lights can be hung around the room and party tables. Let the kids make funky flamingo flip flops with pink and green / orange colored fabrics. See complete directions on our Flip Flop Craft page. Set up several plastic flamingos at different distances from the "throw line". Buy or make (from large plastic lids - cut the center out of the lid so you have a ring) 5 or 6 large rings for the kids to throw onto the flamingos necks. Have the guests line up behind the "throw line" and one by one try and ring the flamingos necks. Give different point values to each flamingo. Add up the total score and give prizes to the highest scores (and small prizes to everyone who plays). Look for only pink things on a scavenger hunt. See the Scavenger Hunt rules and directions. Strawberries dipped in chocolate or set up a chocolate fountain.